MEMOFIN - Risk Measurement and Calculation of Global Exposure and Counterparty Risk for UCITS - L'information financière que vous ne trouvez nulle part ailleurs ! The revised Undertakings for Collective Investment in Transferable Securities (UCITS) Directive puts in place a comprehensive framework for the regulation of harmonised investment funds within Europe. The extensive requirements with which UCITS must comply are designed to ensure that these products can be sold on a cross-border basis. The most recent version of the Directive also introduces a management company passport. Directive 2009/65/EC, which was adopted in 2009. It is a ‘framework’ Level 1 Directive which has been supplemented by technical implementing measures. Directive 2007/16/EC1; Directive 2010/43/EU2; Regulation No 583/20103; Directive 2010/42/EU4; and Regulation No 584/20105. 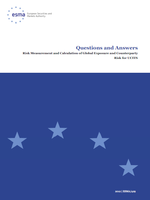 ESMA’s predecessor (CESR) produced a series of questions and answers (Q&A) based on questions received through CESR’s MiFID Q&A mechanism. The Q&As reflected common positions agreed by CESR Members. They were one of the tools used by CESR to elaborate on the provisions of certain EU legislation, thereby fostering supervisory convergence, and were considered useful by external stakeholders. ESMA has therefore decided to introduce a similar mechanism in the UCITS area. Similarly, ESMA is required to play an active role in building a common supervisory culture by promoting common supervisory approaches and practices. In this regard, ESMA will continue to develop Q&As as and when appropriate.